When I was on bed rest with my second child a well-meaning friend bought my husband and me a baby book. 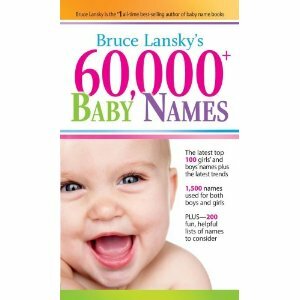 20,000 baby names if I remember correctly. Blessed with a captive audience my husband would read names to me ever night and endlessly discuss them. We went through the entire book without finding a name the both of us could agree on. Choosing a name is just as tough for your fictional family. Maybe more so because fictional characters can’t demand to be called by a nickname when they realize just how horrendous the name you’ve picked out is. So here are a few of my husband’s baby name rules, adapted for the world of fiction. The first and last name should sound good together. According to many baby name books long first names should have short last names and vice versa. Don’t give them a name kids can make fun of in the playground. Of course in the world of fiction this works both ways. If your character is a nerdy, got picked on in the playground kind of person they need a nerdy name. Close your eyes and say the possible name. Does the person that pops into your head look anything like your character? Being symbolic. Names have meaning. Are you picking a name because it means warrior or strength or has some other symbolism that plays into your book? Just ensure that you like the name even without the symbolism since chances are that most of your readers will never pick up on that hidden meaning. Don’t be too cute. There seems to be a trend toward characters with first and last names beginning with the same letter. How many people in real life do you know with matching names? While we’re on matching names…many fictional families have siblings with matching names, either the first letter matches or they rhyme. This may work in the real world but in the world of fiction it only causes confusion when readers are getting to know your characters. Give your characters different names to help readers distinguish them from each other. Friend’s names. Be wary about naming a character after a friend or, heaven help us, their child. You will never convince them that the character is NOT them and if your character does anything unfortunate(murder someone or even just sass back to their mother)you will never hear the end of it. Say the name out loud. Does it roll of your tongue? Hopefully you’ll someday be doing a reading in a bookstore and you’ll have to say this name out loud. Can you wrap your mouth around it? And while we’re at it, is this a name that is difficult to say or spell? Will you spend the rest of your writing career correcting people when they say it wrong or seeing it misspelled in book reviews? Good luck with your naming and by the way, we eventually named our second child after the girl who sat in front of me in Chemistry in high school. I thought her name was pretty. Yes, we did stretch rule #6 but, since I haven’t seen that girl in over two decades, I don’t think there’ll be a problem. Can you remember the best or worst character names you’ve ever read? Jodi M. Webb finds some of her favorite character names in the phone book. When she isn't reading the phone book or organizing WOW Blog Tours, you can find her blogging at Words by Webb. Stop by, she's giving away novels in March! This post came exactly as I was tweeting people for help with naming characters. So thanks! Great suggestions on naming. I never realized so much thought went into a character's name. One of my pet peeves is exotic names. There may be a time to use them but be wary of choosing an exotic name just to make the character stand out. Nice to see I'm not the only one that obsesses over the names of my characters! I wrote a book where an entire race of people were all named after lesser characters from the Bible. Nobody really seemed to notice but I liked the effect because it set the race apart from the humans whilst giving them a strong "other-race" identity. Very helpful. Thank you. I try to avoid naming characters after people in my school in case they read my work. Google can offer some very good websites after a quick search. I'm very random about name picking. Sometimes I'll pay a private homage to a television or book character I love(In my WIP, a character's last name is Harris, a private nod to my adoration of Xander from Buffy). Sometimes I scour baby name lists. Other times I'll just head to Twitter and demand that followers shout out names until one strikes my fancy. I write about everyday people, so I can't have exotic names. No Esmereldas or Horatios. Davids and Janies and Drews abound in my worlds. The book I'm writing has a combination of names from different nationalities and is also set during WWII so the names have to be timely to the period as well as the country. Any screenwriting book will tell you about how to name characters and I follow that lead as well as writing a bio for each character, even if the reader will never know some of the information it helps in forming how the character will react to a situation. I like looking through online lists of names to see if any have special meanings. However, some online naming sites aren't really reputable or complete. But I'm too afraid to check out baby name books from the library in case they think I'm pregnant, haha.